2007 was a good year for us. We hope that it was a good year for you too! We have had the pleasure to continue building client relationships with our long-term clients and begin the growth process with a number of new key clients. It has been a year of growth in our client base and out products and services offerings. For us, 2008 is looking to be a really exciting and challenging year. It will be the year we formalize our training facility for both end users on applications and for SMB IT professionals on running an IT business, SBS 2K3, and SBS 2K8, and other SMB based products. We will also be formalizing our training materials for the Web too when we get our site updated and restructured. 2008 will be the year we actively work at starting an SMB/SBSC based Microsoft Support Group hopefully affiliated with our Edmonton Microsoft User Group. It will hopefully be the year we can meet some of you face to face that we have been conversing with since starting the blog. There are so many neat and challenging things happening in our industry right now! Here is to embracing the challenges in our industry as well as within our own business in the year 2008. Cheers and a prosperous new year for all of you from all of us here at MPECS Inc.
Labels: Blog, Microsoft, Microsoft Small Business Specialist Community, Microsoft Small Business Specialists, MPECS Inc.
A while back, we worked on recovering a Lenovo T60 from a crashed hard drive via the built-in Lenovo backup/recovery tools: Lenovo Rescue & Recovery experience. Given our struggles to recover the laptop via the Lenovo Rescue & Recovery (R&R) to the most recent backup that our client had, we were expecting more of the same when we had another T60 come to us. In this case, the laptop had a Trojan infection. Given the nature of the infection, we flattened the system. Because we do not have any R&R system backups to recover from, we needed to restore the laptop to factory defaults and build up from there. We were fortunate that we made a copy of the T60's recovery DVDs at the time of the last image as this machine could not be trusted to generate clean recovery disks. After booting the first R&R disk to initiate the Factory Default recovery process, we were able to find our way to restoring to default. Once we had made our selection though and we were told to remove the disk from the drive and click OK, nothing happened other than the OK window disappearing. The machine was left on the bench for about 10 minutes with no further action by the laptop to reboot. We had to force power the unit down by holding the power button for about 5-10 seconds. The R&R environment came up again, and asked us to insert the Boot Disk 1 again which we did. It rejected the disk and asked for Boot Disk 1 again. This time we put in the Product Recovery disk 1 in and it seemed to be happy. Once the recovery process finished and we booted into the OS we still had to wait for the configuration scripts to run which took quite a while. Keep in mind that besides the needed Microsoft Updates, the Lenovo update feature will need to be run and there will be a lot of Lenovo updates to pull down. In this case, with the optional and some of the features updates we hit 660MB. All in all, in our experience, the Lenovo R&R setup needs to be refined. From poor documentation or instructions, to the R&R environment's own inability to follow through on our click commands, there is a lot of room for improvement. Security Vulnerability Research & Defense. Information from Microsoft about vulnerabilities, mitigations and workarounds, active attacks, and other related guidance and information. The blog will discuss "more in-depth technical information about vulnerabilities serviced by MSRC security updates and ways you can protect your organization from security vulnerabilities." As always, security bulletins or security advisories are the ultimate authority but we’ll try to include juicy spill-over technical stuff in the SWI blog. This is definitely one for the reader! Via the Micrsoft Exchange Team Blog. Our data mule system has a lot of software tools loaded on it for the various tasks we require of it. Recently we swapped out the Intel DG945 based board for an Intel DQ965GF running an E6600 Core 2 Duo. The Pentium D 945 just wasn't cutting it anymore for the multiple tasks that can be running on the system at the same time. The hardware swap caused Windows XP Pro to hiccup an activation request which was expected. However, Symantec's Norton Ghost also coughed up an activation request. When we entered the key on the back of the CD sleeve it refused the key. Nothing we did could fix it and we just did not have the time to mess with it. So, we called Symantec Support. The last time we did that, the script jockey (front line support) had us repeatedly delete registry keys all the while warning us that any modifications we were making may kill our system! Needless to say, we did not follow their directions while managing to decipher which keys we really needed to kill from their instructions. After punching in the given code, the support person was able to take control of the system. 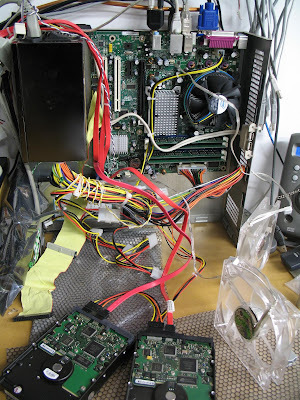 While the data mule may not be the prettiest thing to look at - the MB, PSU, HDD and extra USB ports are all mounted to an old Compaq desktop case cover - the system is business critical. We do all of our imaging, virus cleansing, data transfers, and DoD style hard drive wipes (up to 11 SATA drives simultaneously), and more on this system. So, surrendering the wheel to an unknown was not an option. The support person was completely grilled before allowing them to go anywhere on the system. There was no way someone reading from a script was going to proceed. Fortunately, the person on the other end of the keyboard and mouse had a pretty good grasp of the product and the methodology needed to fix the problem. After monitoring their progress for while, we were able to work on other bench related tasks so as to could keep an eye on the Data Mule screen. They ended up using the Norton Removal Tool, rebooting, cleaning out the registry and the software's folders, rebooting and reinstalling Ghost. The activation process was able to work after that. They were on the system for about 60-90 minutes. Their remote support tool automatically reconnected to the support session after we logged in. Doesn't that experience, and the gut reaction, say a lot about how we perceive manufacturer's penchant to save pennies by off shoring? It is truly sad that, from where we sit, some companies just do not seem to care about anything beyond the initial sale. And for us smaller I.T. support folks, it better be a lesson: Never ever leave a client high and dry after the sale - no matter what happens ... Be there for them! We finished setting up a new Acer TravelMate 6592G Windows Vista Business laptop on a client's SBS network. The G:\ folder does not exist. 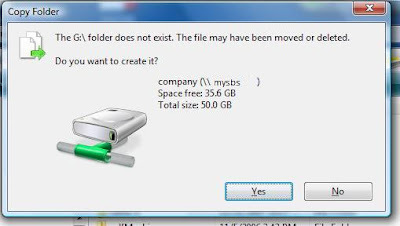 The file may have been moved or deleted. Do you want to create it? Options are Yes and No with neither bringing about the desired result. Apparently this has to do with some corruption on the original Windows Vista image that Acer used to deploy with. All will be well after the reboot. The fix was obtained via search that pointed us to Microsoft KB 934160: Error message in Windows Vista when you try to rename a new subfolder in a shared folder on the network: "The folder does not exist". An alternative is to export the key created above to a registry file for quick access later. We have a client that we just finished scanning a whole bunch of architectural sketches into high resolution Photoshop files. We now need to render those files to TIFF format for their access as well as small JPG format for email use. There are close to 200 80-150MB files. Can you imagine opening each file then "save as" twice for the two required formats? We would be here for hours if not days. So, to do that in Photoshop, we need to create a "Batch Process" that will automate the whole thing for us. Initially searching across the Internet did not yield any results on the how-to because we did not know the proper terminology to use in the search. The keyword is "batch". Now that we know how to run a batch job to render the images, we can sit back and have a tea while the system runs the job. UPDATE: For doing the actual conversion process, there is a built-in Image Processor that the CreativePro link indicates. It works on both the PC and the Mac. In our case, the files are being hosted on the client's Small Business Server 2003 Premium box. Note the Simply Accounting 2008 server service is also running on this particular box. Keep in mind for busy accounting offices whose SBS box is nearing its performance limits, these two server services may push the box over the edge when a number of company files are open at the same time. We did run through the "Alternate Setup" process to configure the workstation as a host for the file and it seems to work okay. Users on a simply Internet Router setup may have issues with name resolution or changing IPs, but it will work. Note that any third party firewall software may interfere with connectivity too. 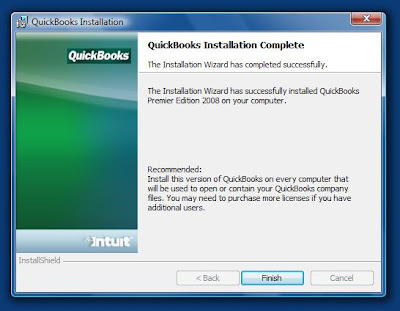 Just as we were finishing up the setup on a new laptop for one of our accounting company clients, Intuit's new QuickBooks 2008 (QB) showed up in the mail. We chose the Expert method since we need to see just what is happening. The first option would be used for those who are installing in a peer to peer situation and require more than one user to access the company file. Keep in mind that larger company files that have not been purged of previous years' data should be setup with a full Gigabit infrastructure. Otherwise reports and other types of operations may take some time to complete. The second option is the standard stand-alone setup. 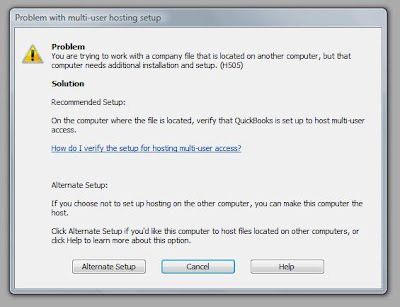 This is the default method for installing QB on a stand-alone workstation where no shared access would be required. The third is to install a TSR to serve the company files from a server share on the network. A separate post will cover this. 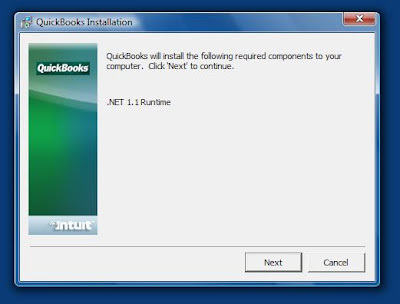 In this case, we are installing on a system that will only be accessing QB' files via a network share so we will install using option 2. We are installing QB on a new Acer TravelMate 6592G with a factory install of Windows Vista. Once we have installed .NET, we are warned about the need to close any open windows or programs. 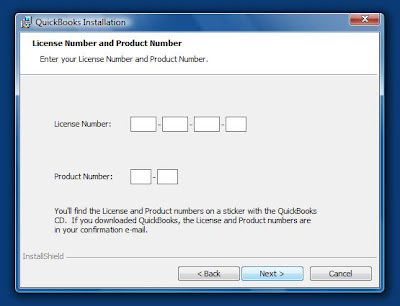 For those who obtain their install media via a QuickBooks Support subscription, the proper codes will be in a letter that accompanies the install media. 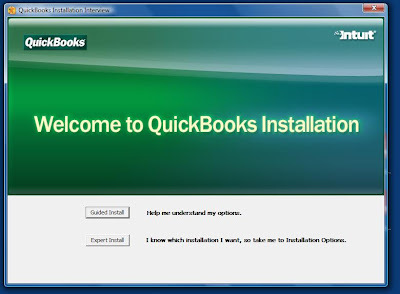 Do you want to use Google Desktop in QuickBooks? 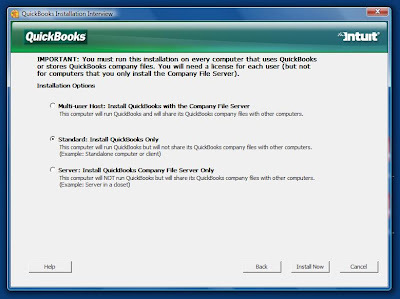 Google Desktop integration with QuickBooks? From the paragraph just above the "More About Privacy" button. 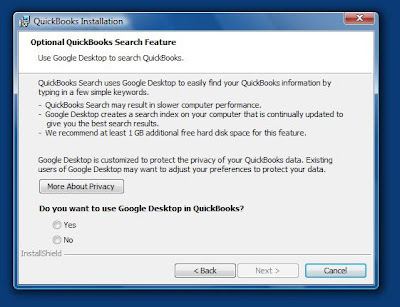 Google Desktop is customized to protect the privacy of your QuickBooks data. Existing users of Google Desktop may want to adjust your preferences to protect your data. This definitely bears more investigation as we are getting prepared to install QB08 on our accounting systems here in the office. For now, we will be answering "NO" to that question. We will run through the "Guided Installation" method on a Vista VM with undo disks enabled to see how this question is posed along with any other "surprises" that may appear there. We are no longer forced to reboot the system in order to initiate the QBUpdate Agent that runs in the background on the system. 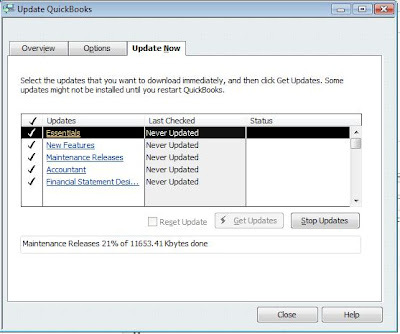 We use the Sample company file to activate QB and to run the update process. 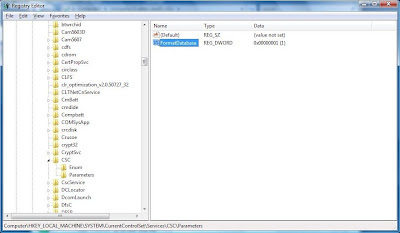 Note that the Sample company file is still in the \Program Files\Intuit\ folder and thus the permissions error. All in all, other than the Google integration (our opinion), QB 2008 runs flawlessly on Windows Vista. 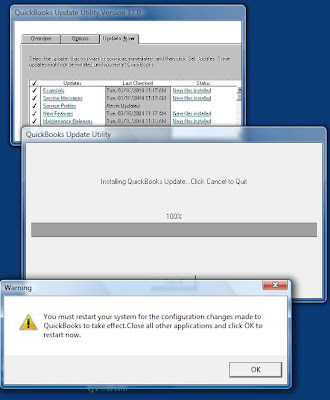 You must restart your systems for the configuration changes made to QuickBooks to take effect.Close [sic] all other applications and click OK to restart now. Kudos to Intuit for making things right! We took care of a friend's I.T. business for about 3 weeks while he and his family were travelling about Europe. At one point I had to pop into his office to manage some server related issues at his principle workstation. He had the Logitech MX Revolution (product page) installed on it. The mouse is impressive to look at and even more impressive the first time it is used. It has a really good well balanced weight to it with the glide pads on the bottom of the mouse providing a seemingly friction free movement. It fits the hand really well. The mouse's button positioning, the ability to utilize Windows Vista's Flip 3D feature via the side mounted scroll wheel, the main scroll wheel's ability to smooth scroll while viewing long Web pages or click scroll when working in Word Documents (changes on the fly) demonstrates that Logitech put a lot of thought into the mouse's abilities and features. The driver that shipped with the mouse was out of date. Make sure to visit the product's download page beforehand: MX Revolution Download Page. Once downloaded, the SetPoint for Windows Vista x64 installed flawlessly and provided the ability to customize all of the buttons and scroll wheel actions. Those who need mousing accuracy, such as CAD operators or professional publishers, will appreciate this mouse. All in all, this mouse has made an excellent addition to our key workstations! By the way, the MX Revolution is both PC and Mac friendly. Merry Christmas, Happy Hanukkah, & Happy Holidays! Have a safe and wonderful Christmas, a happy Hanukkah, and Happy Holidays! We take the Christmas break as an opportunity to implement larger projects at our client's locations while they are down. So, we generally take Christmas day and New Years day off, but work the rest of the week days. Our break will come sometime later in January. Thank you all for the great support, contributions via comments and email, and for encouraging us to continue blogging by your readership. We hope that 2008 will be a prosperous one for all of you! Office 2007 - Config.xml Error - Whitespace is not allowed at this location. For those of us with absolutely no HTML/XHTML/XML coding experience, we may run into a bit of a headache when setting up Office 2007 to install via Logon Script and Group Policy. Cannot view XML input using XSL style sheet. Please correct the error and click the Refresh button, or try again later. It is pointing to the space just after the actual cause of the problem. What we need to remember is the file is coded in XML. Therefore, we need to follow XML coding rules when trying to insert special characters like the '&' ampersand in the above example. You can see that there is an actual '&' ampersand in the COMPANYNAME value. A list of the codes needed for special characters like the '&' ampersand can be found here at Wikipedia: List of XML and HTML character entity references. Note the "&amp;" Ampersand+amp+Semicolon in the COMPANYNAME value. This code value will cause the XML to be rendered correctly. For a complete explanation of the various settings in the config.xml file go here: TechNet: Config.xml in the 2007 Office system. We are in the process of installing our first Windows Vista based laptop at one of clients that run a large accounting practice. Once we were into the Caseware 2006 program though, everything seemed to start up as it should. We opened an existing file, worked through its contents and previewed the reports in Caseview with no issues. Caseware International: CaseWare Working Papers - Minimum Supported Configuration - IMPORTANT · Microsoft Windows Vista and Office 2007. Download the version recommended and update Caseware for Vista compatibility. *Ack* ... hit the enter key once too many and it published! :( The original mistake post has been deleted. One of the opportunities that a Swing Migration (SBSMigration.com) provides for us is the ability to clean up Active Directory (AD). There are many times where the only real way to clean up a mess made in AD previously is to utilize Jeff Middleton's Swing method. We have a client that has had their SBS 2K3 Premium installation in place for a number of years now. Their AD has a lot of GP settings that need to be purged along with some OU and group restructuring. To facilitate a successful Swing Migration, we are going to utilize ShadowProtect IT Edition to image the original SBS box to new hardware along with a couple of the workstations to similar hardware here in the shop. We can then proceed with the Swing Migration on their "production" environment to make sure that we do not hit any unforeseen problems. This method will also give us a good idea of how the workstations and the user's profiles will react to AD cleanup and the Swing. For this kind of sensitive operation we prefer to work with actual hardware versus virtualizing everything. This gives us the opportunity to see if existing hardware and software drivers or OS installations will have a play on the success or failure of the Swing Migration. We intend to utilize this method from now on to run through the Swing Migration before hand. We can then make sure we are not hit with any surprises on our more complex SBS setups that require tweaking before reinserting the new SBS hardware or the reinstall of the existing SBS hardware back into the production environment. For the more sensitive or not so stable SBS environments where new hardware and/or upgraded SBS OSs are going to happen, utilizing this method will save us from having to clean up the production environment during the actual Swing process! We can leave the production environment alone until we come back with the new SBS box to copy newer data and shut down the existing SBS box. Swing Migration Terminology references in this post are particular to the Swing Method. Out of respect for Jeff and his hard work, we suggest the you head over to his SBSMigration.com (Duet TechPro subscription page) site and sign up for a subscription. If you belong to a Microsoft User Group, check and see if your group is authorized for a Group discount before purchasing your subscription. If it is not, then talk to your group leaders about getting on the list. It will save you $45.00 on your first purchase or subsequent subscription renewal! We had a chance to work with WHS during its beta cycle. Lately however, we have been pretty busy so there has not been too much opportunity to spend too much time with it. We have ordered our Windows Home Server Eval Kit and are awaiting its arrival now. We are starting to see some interest in WHS with our clients, so we will be delving into WHS when the Eval Kit arrives. While WHS is being promoted as a plug-n-play setup, many of our clients would prefer a professional set it up for them. WHS is a possible niche market for us ... we shall see. Folks, for anyone who has worked at coding Web sites on HTML and subsequently XHTML + CSS, the advent of Internet Explorer 7 (IE) was a huge step in the right direction. IE7 helped that process along by at least rendering Web pages without too much in the way of painful extra coding. Though, it is still a long way from pure coding pleasure. The litmus test for properly rendering a properly coded XHTML + CSS based Web site is the Acid2 Web Browser Test. The Acid2 test is brutal. Check it out with IE7 and see just how far away it is. In my own experience, the only Windows based browser that can pass the test is the current version of the Opera Browser which is 9. The Internet Explorer team announced that the IE8 will properly render the Acid2 Test! Since a significant junk of the world browses the Web with IE, this is a huge step in the right direction and a huge relief for Web site coders everywhere. As long as Web Standards remain the focus of the IE Team, coders will no longer need to keep such a large stable of coding hacks to make sites work on all browsers. And, with this announcement there is now pressure on the other browser creators that are not Standards compliant to pick it up and get their browser products compliant. In the end, we are the winners! As Standards are adopted, Web sites will no longer look different or not render at all on the various Web browsers out there. We have a number of client wireless installations in residential areas for partners of the firms we support. The competition between the various Access Points (AP) in the neighbourhood can be extremely frustrating to overcome. To date, we would setup a couple or three APs to keep the home covered by the wireless signal and force out the competition. 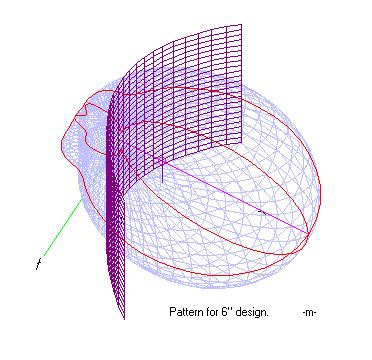 One can make one: Parabolic Antenna Template. Or, one can purchase one: Tritium - Flatenna. We will make a couple up for the home installation to see how it works as we have 13 competing APs in our own neighbourhood ... many of them unsecured. Thanks to Scott S-A of Roderick Scott Corporation for pointing us down this particular path. With the advent of Windows SharePoint Services 3.0 (WSS), there has been a relatively small pool of resources available for those of us who need to install and configure WSS sites. The 5W/50 series is an excellent overview and run through the install and configuration of WSS. While the Web sites can be very helpful, there is still a huge need to fill in the gaps. SMB Nation: Microsoft Small Business Specialist Primer: Your Certification Path to Success! As soon as we found out about the MSBS Primer from SMB Nation we placed an order for some. With the release of the MS Press book apparently being today, we will be ordering a copy or two of it as well. Having the books around for reference, or to take along for a working trip to read and study, is an excellent way to delve into a product's install, configuration, and management methodology as well as a great way to discover the "why" things work the way that they do. decided that the mouse was no longer allowed to connect to the system. The connection between the mouse and the system was repeatedly failing. The reconnect dialogue would pop up to run through the time consuming process of getting the mouse reconnected. It was a very frustrating experience for our client. We have since replaced the kit, but we now need to obtain warranty replacement ourselves. United States: (800) 360-7561, Monday through Friday, 5:00 A.M. to 7:00 P.M. Pacific Time. Canada: (800) 933-4750, Monday through Friday, 5:00 A.M. to 7:00 P.M. Pacific Time. TTY customers: Contact Microsoft at (800) 718-1599, Monday through Friday, 5:00 A.M. to 7:00 P.M. Pacific Time. The folks behind the Canadian help line were very helpful and efficient. Make sure you have the product in front of you when calling so as to provide the PID that is on the bottom of the keyboard. We will receive our replacement in the next couple of weeks via Purolator. All in all, this was one of the better RMA situations we have had recently. We have already chronicled some of our challenges with the new version of Simply Accounting 2008 on Windows Vista and SBS. We have a new client that uses the Simply EFT (Electronic Funds Transfer) module. In this case, we installed a new Vista Business workstation and configured everything to run with the exception of the EFT module. Because our client carried forward the Company File EFT settings from the previous system, we were not expecting any issues. However, when they went to run their payroll, the EFT file creation failed every time the process ran. The EFT module installs to: C:\Program Files\SimplyEFT with the data being created in a subdirectory called C:\Program Files\SimplyEFT\Data. The problem we were running into was the EFT program did not have permission to create the EFT file in the Data directory. Our client did not want to go through with recreating their company's EFT setup, so we went with option two. After the permission change, they were able to run the EFT process and upload the file to their bank with no issues. With the release of the new 3200 series uniprocessor server board chipset and 1U chassis, we are in the process of looking into the new H series 1U server systems that will utilize the 3200 series chipsets. We utilize uniprocessor 1U units for virtualization, Web application hosting, sometimes secondary domain controllers, and for a few other task specific reasons. In the first advisory, the new 1U H series uniprocessor with SATA Hot Swap Backplane will fault with an amber LED. This is a manufacturing issue that can be resolved by calling into the Partner Hotline to obtain a replacement SATA hot swap backplane if the unit delivered is affected by the problem. The second is also a manufacturing issue. The systems may have shipped with identical rack handles instead of one right and one left handle. A call into the Partner Hotline and a replacement will be had very quickly. As long as the delay we face falls within that timeline we are okay. If it doesn't, then a call to the client with an explanation of why we need to delay delivery is usually acceptable to our clients. For the most part though, we end up with everything ready for delivery ahead of schedule. Nothing beats a phone call to our client stating that we are ready to integrate a new system ahead of schedule. It makes us look good and our client happy that they are going to receive their solution ahead of schedule. We have one client that we have been holding off the application of Windows Server 2003 Service Pack 2 due to the age of the hardware and stability issues we have encountered on this box after updates were applied. We have recently installed ShadowProtect on this server and setup a backup regimen. So far, we have had two successful backups. Since those two, we have been unable to get a backup to successfully write to the USB hard drive. For now, we have modified the backups to stream across the network to their data mirror server which also serves as a backup server. The network version seems to write okay. There are a lot of these types of VSS errors showing up in the logs. 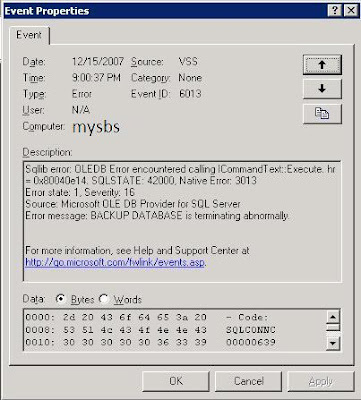 A quick search turns up VSS event 6013 on SBS at the TechArena forums. The first three KB articles pointed to in the response are included in SBS SP1. We are working with a server that is up to date in this regard. And, of course they all point to the newest Windows Server 2003 Service Pack 2. This is one server we have been trying to avoid applying the service pack due to its history. We are now in a position where we will need to be in the office after hours, run a full backup after booting to the ShadowProtect Server Edition CD to a USB hard disk, or the network if the USB drive fails, and boot the server up and make an attempt at the service pack. At least we have great insurance in the ShadowProtect backup if the SBS OS decides to choke on the service pack. Recovering the system partition will only take a couple of hours if the service pack does indeed kill the server. Our ability to provide product support to our clients sometimes hinges on our being able to turn to someone more knowledgeable than we are on a particular software or hardware product. When we encounter the first in line call jockey that is essentially reading from a script and gets totally lost when the question asked is not on the list, things get frustrating really fast. We were working on a support issue for a popular accounting product. The company moved their support off this continent around two or three years ago. Anytime we have called into the system it has been hit or miss. Today, the first in line person kept putting us on hold to, "consult their mentor" when our questions did not fit on the script. How in the world are we supposed to have confidence in the company's products and their support if they cannot provide front line support people at the other end of the phone line who have actually worked with the company's products and understand how things really work? The frustration became too much. So, down goes the phone, then up it goes again to try calling into the system yet again. Hopefully the second time around we would land someone who actually knows something about the product. We were fortunate ... this time. They did indeed know the product well enough to coach us through to the source of the problem and eventually how to fix it. This fellow was not reading from a script. Our clients, and those of us that support them, end up being the victims of a company's bottom line. We end up burning huge chunks of time in wasted efforts to get things working while in the mean time those who are supposed to help us in that endeavor are almost completely useless. In the end, that product costs us a lot more in wasted time and lost productivity. And, the really frustrating point: What choice do we have to influence those companies to provide us with people who can actually support their products and do so in a timely and knowledgeable manner? There are some new guides for us to read on Vista's upcoming service pack 1. We haven't taken to applying the service pack beta release to any of our Vista installations yet as we haven't had any time to sit down and go through these documents at this point. Once we have had a chance to go through the documentation and assess the impact of the service pack, we will start applying the service pack to our lab based systems. If they show promise, we will then acquire a few ShadowProtect images of client workstations to see how they react to the service pack. Once the service pack formally releases, we will go through the process again to make sure that the changes made between the current beta versions and the actual release version won't cause problems. We will then wait a few weeks and browse the Web to make sure that others are not having critical issues with the service pack's application. It pays to be careful when it comes to service packs. Folks, the original Office 2007 Basic, Small Business, Professional, and Home & Student OPK kits that we could get through our suppliers here for less than $10 each are no more. That reduced rate was some sort of introductory offer. The part number, if you can find it was: 269-11458. Our suppliers here in Canada have at least a few of the above key words in their descriptions. Part numbers and search terms may vary relative to your particular geographical/language area. There is one other offer that one can take up via Microsoft's OEM Web site: Order 2007 Microsoft Office OEM Preinstallation Kit (OPK) Master Kits. 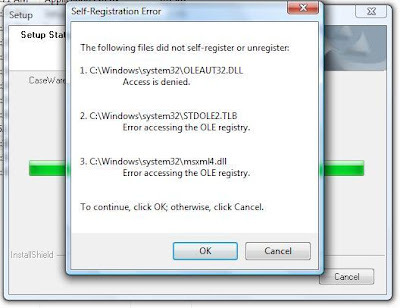 Note that if a company is not registered with the OEM site, then one will need to complete the registration process before obtaining the kits. A company is allowed to order 3 free copies of the kit before being referred to an authorized distributor to purchase the royalty based discs. For those clients that insist on getting media with their OEM license, they can order a backup media copy from here: Microsoft Office system backup discs for medialless license kits. NOTE: The client will be required to provide their OEM install key to complete the order for backup media. And, the offer expires 90 days after the purchase of their system or systems. We have some WSS v3 sites that will be updated soon with Service Pack 1. Microsoft released Service Pack 1 for Windows SharePoint Services on December 8. MS KB 942619: After you apply Windows SharePoint Services 3.0 SP1, an event is logged in the Application log on the server: "User, group, or role 'WSS_Content_Application_Pools' already exists in the current database"
As always, read through the documentation to make sure none of the client's infrastructure will be impacted by the application of the service pack. And, have a good backup in place and a recovery plan "B" in place before running the service pack on the server or server farm. If the server does not have a UPS capable of at least shutting the server down gracefully ... what happens? Well, if one of the hard drives in a RAID 1 array was just a little flaky, then it is very likely that the shock shutdown may kill it. Or, if there were some sort of OS corruptions hanging in the balance, they may show themselves with a no boot situation. How do we know that one of the drives is flaky after the power outage? The OS will take an inordinately long time to boot, and may, or may not, have a service failed error after the outage. Our backup restoration method has not been tested yet and it fails. Or, if the UPS has no A/C power filtration capabilities at all, it may let the subsequent series of spikes through to the server when the power comes back up. This in turn may cause a problem. Keep in mind that the initial spikes may get filtered out by the existing UPS, but the smaller subsequent ones may not. Network switches, DSL/cable modems, etc protected. Workstations have at least a 3K+ Joule surge arrest in place on their A/C, CAT 5e, and telephone if needed. Workstations used for database work have at least a 1000VA UPS with filtration in place for graceful shutdown of the database. After installing a new UPS, one of the first things to do beyond the UPS' own self-test routine is to test it. We need to know how that UPS is going to behave in the environment it will be protecting. Unplug it after at least 24 hours after delivery and setup to give it enough time to go through a charge cycle. Sometimes a factory defect may not show itself until the UPS flips over to battery mode for an extended duration. So, it is better to know that the unit is going to fail before an actual power event brings a defect out and causes even more grief. We had a client desktop running a Core 2 Duo E6420 based system with Windows Vista Business 32bit installed on it. Lately, they had been having a weird experience with the Recycle Bin icon where it will not change from indicating "empty" to indicating "full" when something is deleted on the system. Click on the desktop and hit the F5 key, and the icon changes. But, it would not automatically change with the Recycle Bin's status. Close the Personalize appearance and sounds window. The icons should now behave themselves. Thanks to commenter Sam about half way down on ItsVista: ItsVISTA Tip 19: Restore Your Vista Recycle Bin Icon. When a business depends on a system or component's horsepower to accomplish things faster to improve efficiency and cost effectiveness, one looks for items that can help along those lines. For 3DS Max (3D Studio Max), more cores plus RAM plus GHz means more frames rendered per minute. Having more cores across the corporate rendering "farm" means more frames rendered as well. As we are delving into the creation, management, and deployment of Windows Vista WIM images via network share, we need to have a quick device to boot the system with since we have not graduated to Windows Deployment Services yet. Using a network share based deployment will be the environment we will be working with at our smaller client sites where server transitions may not be as frequent as the larger ones. So far, we have used an 8GB Transcend (JF V10) which had dismal performance. We did not keep this one too long. The 1GB Kingston Elite Pro did pretty good. It managed to boot the WinPE environment is a respectable amount of time. We ended up bringing in an 8GB and a couple of 4GB OCZ ATV Turbo flash drives to test out their ability to boot WinPE quicker. We were pleasantly surprised. They are fast! The online reviews were accurate. They definitely can pull their own weight when it comes to bringing the WinPE environment up at least 20-30% faster than the Kingston Elite Pro did! This speed improvement will save our client's money where we will be required to be on-site for their deployments. It will also save us a lot of time for our training lab deployments. They will also be our Technician's Thumb Drive and for booting DOS for BIOS updates and the like. Windows Vista - Multi-partition Booting with Linux? Why? With the advent of extremely fast USB flash drives and the ability to set them as Active, one cannot help but figure out that there really is no longer a need to have multi-boot partitions on a single hard drive. Need to run Ubuntu Linux? Reboot to that flash drive and away you go: Ubuntu: How to install Ubuntu Linux on a flash drive. Or, one could have an eSATA or USB external hard drive for the same purpose. One really does not need to mess around with multiple partitions or have dedicated internal hard drives for a particular flavour OS anymore. Another good information site: Pen Drive Linux. Port 25: Using Vista's Boot Manager to Boot Linux and Dual Booting with BitLocker Protection with TPM Support. In the last example, Sony did capitulate to Toshiba with the requirement that one technology aspect of the MMCD be brought into the SD spec ... and the DVD was born in 1997. Are we seeing a pattern here yet? Is there going to be a time where Sony will play in the sandbox nicely with others? Given the company's history, there is very little doubt that Johnny is always going to try to keep that toy to himself. It is unfortunate, because we lose. All of us. Instead of having a plethora of manufacturers producing the stand-alone HD players and optical drives for PC/Laptop, we have one manufacturer producing one type of product and others producing another type of product. Then there is the whole rigmarole behind which movie studio will back which HD disc format. So, after our home DVD player tanked, we decided to weigh in on the battle with our pocketbook. And, we chose HD DVD. There are many sides to this story, with who believes which product is better and why we should support it. For the last couple of weeks or so, I made sure to ask every representative at the various electronic stores I visited as well as doing some online research to see which would be the best choice. In the process, there have been some very clear answers with good information, and a few passionate ones with less information. All in all, things came out fairly balanced. Blu-ray does seem to have a bit of a technology edge, but the biggest factor: economics - that is the wallet - will win and that is where I believe HD DVD will come out ahead. It seems pretty clear that when an HD DVD player at $250CA and a Blu-ray player at $500CA sit close together on a shelf, people will purchase the HD DVD player. Most people, as many have mentioned to me in person as well as online, just want to watch a movie and do not really care of one disc can hold more data or has a bit more protection from scratches. For many of us who have been burned in Sony based format wars before, the decision is fairly clear: Anything but Sony. After bringing home the HD DVD player and plugging it into the Acer AT3505-DTV (true 1080p) LCD we have hanging on the wall, Monique and I were blown away. The difference between standard definition and the high definition was readily apparent. While the Acer is not a 120hz (wikipedia on HD Blur) capable, the image clarity and detail was simply amazing. We started testing StorageCraft's ShadowProtect (blog label search) product a while back. While we haven't had a chance to blog too much about our experiences with the product, we have been quite pleased with our test results and are now in the process of migrating our client's backup solutions over to StorageCraft's ShadowProtect for both SBS and Windows Server as well as key client desktops. We had one of those "Eureka" - light goes on - moments not too long ago when we were getting ready to apply Windows Server 2003 Service Pack 2 (download page) at one of our client sites that is protected by ShadowProtect Small Business Server Edition 3.0 (StorageCraft's Site): As we deploy ShadowProtect on our client's sites, our stress levels go down. In the above service pack example, we were working on an ageing server that may not be replaced by Swing Migration (SBSMigration.com) any time soon. So, if the server choked on the service pack beyond uninstalling and trying to fix things, we were no longer in a position where we would have had to say, "Mr. Client, the server choked on the service pack we applied, we need to restore from the SBS backup and should have the server back up and running by tomorrow morning." We were now in the position to say, "Mr. Client, the server choked on the service pack. We will need a couple of extra hours to recover it using the new backup system we installed not too long ago. Mr. Client, that backup system just saved us a lot of time and effort!" Before we are going to run any major updates or install or update a client's Line of Business application, we make sure to run a full backup the night before we are scheduled to arrive. We then run an incremental backup just before beginning our work on the server or business critical desktop system. It only takes a short amount of time. Having the risks of loosing a server and client data greatly reduced by having an excellent backup in place is a no-brainer. We have seen a number of different software and hardware backup products over the years that have provided us with a good measure of protection. Each had its peculiarities and complexities to bring things back to the way things were if a failure happened. Having the risks of loosing a server and client data virtually eliminated via a software application and a simple USB hard drive, Drobo (product site), or NAS (wikipedia) rotation is truly brilliant. The ShadowProtect Server and Desktop Editions have a fully functional 30 day trial. For those of us working in the I.T. industry, the ShadowProtect I.T. edition provides a Hardware Independent Recovery option where one can install the necessary drivers before beginning a recovery onto different or newer hardware. There is a 30 day trial edition for this product as well. The trial version links will be found on the near the right hand side of the page in the second column as of this blog post. For I.T. shops: Once you have checked out the product, StorageCraft has a Partner Program with good incentives: StorageCraft Partner Programs. We are part of the StorageCraft Partner Program and have found the folks at StorageCraft very helpful in all aspects as well as very responsive on their product community and support forums. An option for our managed services clients is to pop in to their location to rotate their encrypted ShadowProtect USB backup drives off-site on a set schedule. There was no reference to properly removing the USB hard drive anywhere on the system. 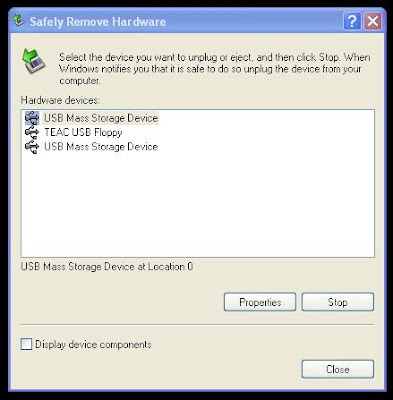 Click on the item we need to remove, click the Stop button, and voila ... we have the ability to swap out the USB hard drives. Once the shortcut is created, it can be used on any Windows box. One can keep a copy of the shortcut on their Technician's Thumb Drive for future use. Shortcut courtesy of: neil's world: Create a Safely Remove Hardware shortcut. For those of us on the front lines of I.T. who work with our client's data needs and protection, the advent of Perpendicular Magnetic Recording (PMR) drives is cause for both joy and apprehension. We now have drives that are being manufactured with huge data capacities for literally pennies per gigabyte. We can now easily configure 5+ Terabytes of RAID 5 or RAID 6 storage arrays with ease for those clients whose data volume needs require huge storage capabilities in a very inexpensive manner. Ever have to selectively recover 600GB or more of data off of a large failed RAID 5 array because someone "forgot" to change the tape magazines ... for quite a while? Or, come into a situation where a business critical workstation has had a drive failure with no RAID 1 mirroring or any kind of backups being done? Or, a hard drive has failed in a RAID 5 or RAID 1 array, and the second one tanks before the rebuild completes, thus rendering the array useless? Again, backups were sporadic at best. The general theme here is this: Poor or sporadic backup schedules are the death of a business in the event of (not if) a storage failure. With existing hard drive technology where the storage bits lie side-by-side, all of the effort a data recovery may take is for the drive to be stored overnight in a static bag enclosed in a freezer bag (air vacuumed out) and placed in a deep freeze to render the drive useful enough to recover the necessary data the following morning. We have a freezer here in the shop just for that purpose. Or, in the case of a failed on-board drive controller board ... swapping that controller board out with a known good one to get to the data for recovery. The defective drive would still be replaced by a new one. If we are dealing with sectors of a drive failing, with the current single bit technology drives we may have a fighting chance of recovering data from the bad sectors using the above freezer method, a really good software recovery tool like Get Data Back for NTFS, and a powerful enough data mule system to slave that drive up to. Of course, one needs a lot of patience in some cases waiting for things to come up or the recovery to complete. With the advent of Perpendicular Magnetic Recording (PMR) technologies for hard drives, we need to take very careful stock of our client's data storage and backup setups. PMR places five (5) bits stacked on top of each other for storing data side-by-side. Consider PMR again: We have gone from one bit sitting beside another bit and so on to five bits sitting beside five bits and so on. What does that mean for a bad sector scenario? Instead of a few bits being obscured by a sector going bad, we are now talking about chunks of bits being lost. The other consideration that we need to keep in mind: When we defragment our server and desktop drives now, the algorithms being used to reorganize files on the drive are based on the bits being side-by-side. We will need to pay particular attention to the manufacturer of the utilities that we use to defragment our drives with and whether there needs to be an upgrade to that utility to be compatible with the PMR based drives. Please keep in mind that we do not necessarily know the deep down engineering of the new PMR technology and deframenting them ... so this may be a non-issue. But, the technology is too new to know for sure yet. Our experience does tell us however, that the more prominent that PMR drives figure in our system configurations, the more we will need to keep in mind the possibility of data being non-recoverable from a failed PMR drive. Seagate's Press Release for 1GB Drives: Seagate Unveils One Terabyte Hard Drives as Explosive Growth of Digital Content Continues. There are a couple of steps that need to happen in order for a networked printer to keep working after the printer technician who installed a new printer has left. If one does not follow these steps, one is sure to receive a support phone call the moment the printer's DHCP lease expires and users can no longer print. Since some printers are quite portable, we tend to assign a DHCP reservation versus setting a static IP in the printer's control panel or the built-in Web interface if it has one. This saves one from a support call if someone decides to grab that printer and haul it down to a remote office operating across a VPN and thus on a different IP range altogether. This way we can remote into the system and reconfigure the Remote Office server's DHCP reservations, get the user to power cycle the printer, log off and on again, and they would be printing. On the newer printers, one can set everything up, plug it into the network, pickup an IP address via DHCP, and configure the Device Name to help with printer identification and location. Once we have the IP address, we connect to the printer via a Web browser and we immediately set the "Device Name" to something like: HPLJ4345MFP-Bullpen. Make sure to download the newest drivers for the printer, extract them to a network share, and head to the next step. Right click on "Reservations" and click on "New Reservation"
Hit refresh in the DHCP management console a couple times after the printer has finished power cycling to see the Lease Expiration go from: Reservation (inactive) to Reservation (active). Once we see that the printer has picked up the new address, connect to the printer via a Web browser to confirm. There are other methods to the above one as far as setting the reservation, such as picking up the MAC address from the printer's Web interface, or printing it out before hand via a Configuration Page. Why use the SBS wizard as opposed to getting everything setup via the Printers and Faxes task manager? Because, using the wizard means that everyone who logs into their systems in the morning or after lunch will have the printer installed by default. This saves the extra step of having to install the printer manually. Of course, if users require the printer right away, one would connect them up immediately as the log on/off process may not work immediately. If one uses the Printer and Faxes method, the now setup printer may not show up in the SBS Printers Management console and the printer will not be installed on workstations by default. Local Printer attached to this computer (uncheck "Automatically detect and install ..."
Possible Option: Use Existing Driver? 1: Keep existing or 2: Replace existing. If having any print related issues with same driver based printers ... replace. Otherwise "Keep". Name the printer and select whether it is to be the default printer for the SBS box: HP LJ4345MFP-BullPen. Share Name will pickup some of the above name. Change it accordingly: HPLJ4345MFP-BullPen. Give a brief Location description. The SBS box will install the necessary drivers, share the printer, announce it in Active Directory, and setup the SBS Logon Wizard to install the printer when users next logon to their workstations. 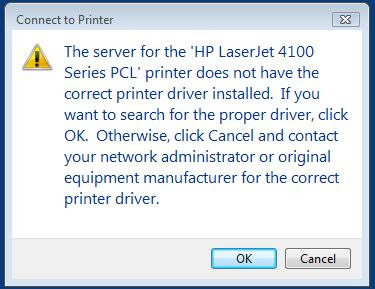 Note that Windows Vista workstations and newer printers may require users to manually install drivers in order to use the printer during logon. Now would be the time to set any special user or print management permissions on the share. The quick method is to GPUpdate /force on the SBS box and have the users log off and on again to pickup the new printer. Otherwise, they will either need to pickup the printer via the share on the SBS box, or in some cases, create the TCP/IP port on their workstations and connect directly to the printer. We have seen some situations where there were struggles with connecting a workstation to a printer via the SBS share and some applications ability to use that shared printer to print with. Thus the need to connect to the printer directly. So, that is something to keep an eye on for the myriad of client infrastructure environments we work with. When we go to the share to install the driver the Vista refused to install using the HP Universal PCL6 or PCL5 print drivers. We needed to create a Standard TCP/IP port to the printer's IP address on the local workstation and allow Windows Vista to use the built-in HP drivers to install a PCL5 driver to get things working. So, in the case of older printers, we may run into a bit of a conflict between the printer being detected via the SBS share and the Windows Vista built-in drivers for that printer. Keep that in mind for situations where there are a lot of users needing the printer or where there are a number of users logging into the same machine. Each user profile may need the printer driver setup individually.